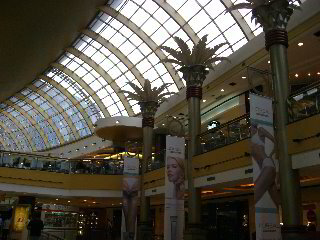 Alto Palermo, a three story mall located in southern Palermo, is a favorite shopping center and hang-out of local teens and young professionals. The building was a market until 1990 when it was converted into the Alto Palermo shopping center. It now holds over 150 shops and restaurants and a children’s play center. This is a great place to get everything you need while staying in Buenos Aires. The prices are reasonable and there are a variety of shops to accommodate your every need and want. There are many stores to buy home décor and accessories; Morph offers unique bathroom accessories, small furniture, lamps and a variety of other home items. Next door to Morph is Home Collection, which sells linens. Another place to buy towels and sheets is Home and Harmony. The back of the third floor is entirely devoted to electronics and gadgets. You can purchase computers, flat screen TV’s, cameras, and video game equipment at Garbarino, M! Musimundo, or Fravega. I was surprised to see so many high end products. Many of the newer items had outrageous prices, so it is much better to buy these things in the United States. I did notice that financing was available on many of the items. There are too many clothing stores to name. You can find everything from high fashion to surf shops. Some recognizable names are Rip Curl, Roxy, Lacoste, Chocolate, Levi’s, Miss Sixty, and Tommy Hilfiger. Prices for imported items are usually more expensive than local brands. The best deals are on linens and leather goods. I would categorize this as a mall to go to if you want to shop like a local, but if you are looking for more of a tourist attraction I would go to Patio Bullrich, Abasto de Buenos Aires or Galerias Pacifico.